“Ahaa!” I got a lot of ahaa moments when I was hacking on Pagure CI , Pagure CI’s initial draft was laid by lsedlar and I have blogged about it followed by me and Pingou. Pingou has done really amazing work with the flow and refactoring of code to making beautiful api calls. Try to do the minimal work in setting up the development environment mock everything that is available for testing. Think deeply about something when your mentor points it to you. So the issue I was working on is a long pending one the issue was to attach build ID to all the Jenkins build Pagure was getting . Reason why attaching build id’s are necessary is to distinguish between different builds and to make the link to Jenkins a bit more specific for example if a build fail which was that build. The first mistake I did was setting up Jenkins on my machine I had it previously but since my machine went under a kernel panic I lost all data related to Jenkins , now Fedora 25 has some packaging issue when installing Jenkins directly. But anyhow from Jenkins site I got a way to set it up and it worked for me. In the mean while Pingou was pointing it out that I actually don’t need Jenkins instance but I was not able to get him on that and I really feel bad about it. After setting up Jenkins the other task for me was to configure it , which was really easy because I have done it before and also because it was well documented. For setting up the documentation is fine but for hacking on the CI you need a little less work. Set up REDIS on your machine , you can do that with installing redis using sudo dnf install redis and enable the service using sudo systemctl enable redis and then start the service using sudo systemctl start redis. Along with this you need to add config for redis in default_config.py or which ever config file you are giving to the server using --config. The configuration are well documented in pagure.cfg.sample. Now, copy the pagure-ci-server from pagure-ci directory into the parent directory. Now once you have done that , this step is necessary because this is the service that run for pagure-ci. Now you just have to run pagure-ci-server by python pagure-ci-server.py. Once this started your service will be up and running. Now you just fire up your instance and make a project , have two branches and open a PR form once branch to other, if you get some authentication error that is most probably because you not done the right permission for users to use Jenkins, this is not recommended but you can entirely turn off the security of Jenkins just because you are testing something. If you have done everything correct you will see the Jenkins flag being attached to the Pull Request. All this could be saved if I have just used python-jenkins to fetch a job from Fedora Jenkins instance and send it as a flag to my PR. Thank you Pingou for telling me this hack. “Amazing!” that was my initial reaction when I heard and read about functional programming , I am very new to the whole concept so I might go a little off while writing about it so I am open to criticism . This is basically my understanding about functional programming and why I got hooked to it . Here we didn’t tell what to do but we told how to do it. This is what I got as a gist of functional programming where we divide our task into various functional parts and then we tell how things have to be implemented on the data. Some of the core concepts that I came across was pure functions and functions treated as first class citizen or first class object . What each term means lets narrow it down . Pure functions is a function whose return value is determined by the input given, the best example of pure functions are Math functions for example Math.sqrt(x) will return the same value for same value of x. Keeping in mind that x will never be altered. Lets go on a tangent and see that how this immutability of x is a good thing, this actually prevents data from getting corrupt. Okay! That is alot to take in one go, lets understand this with a simple borrowed example from the talk I attended. We will take example of a simple Library System now for every library system there should be a book store, the book store here is an immutable data structure now what will happen if I want to add a new book to it ? Since it is immutable I can’t modify it , correct ? So a simple solution to this problem is every time I add or remove a book I will actually deliver a new book store and this new book store will replace the old one. That way I can preserve the old data because hey we are creating a whole new store. This is probably the gist or pros of functional programming. In the above code you can actually see that a new book store is returned on addition of a new book. This is what a pure function looks like. Function as first class citizens , I can relate a lot to this because of python where we say that everything is a first class objects. So, basically when we say functions are first class citizen we are implying that functions can be assigned to a variable, passed as a parameter and returned from a function. This is way more powerful then it sounds this bring a lot modular behavior to the software you are writing, it makes the project more organized and less tightly coupled. Which is a good thing in case you want to make quick changes or even feature related big changes. In the above code you can see that function is passed as an argument to another function. I have not yet explored into lambda calculus which I am thinking of getting into . There is a lot more power and beauty in functional programming. I want to keep this post a quick read so I might cover some code example later, but I really want to demonstrate this code. where acc=1 this is pure textbook and really beautiful code which calculates factorial of n , when it comes to FP it is said To iterate is Human, to recurse is Divine. I will leave you to think more about it, will try to keep writing about things I learn. On 4th of this month we the Jnaapti team planned a small workshop to get 9th and 10th standard kids to get them started with programming . We visited Florence Public School and it was really a pleasant experience to see such fresh minds exercising their mind. I was really amazed to watch them ap proach the problems we gave them, we have a rigid mind and we are really bad at thinking out of the box and that is because we have been taught rather conditioned to go in one direction. But these kids they never knew this problem so they have a very different approach to these problem and I learnt about 7 new ways to approach the famous N-Queens problem. 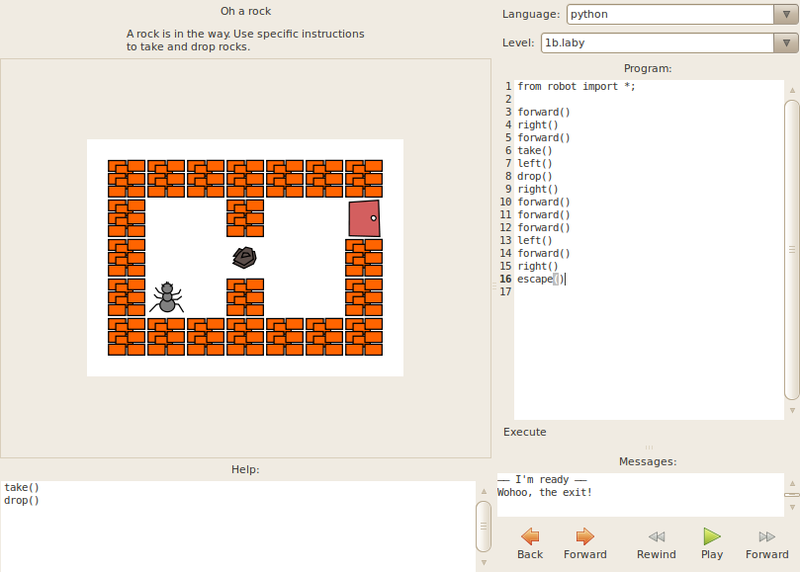 Then came my favorite part “LABY” its a game which teaches programming in a fun way, so the whole idea is to make an ant to reach the door. There are various obstacles that needs to be handled and you know what you are going to use for that ? CODE what else but its super fun to do that and we could see that in those kids. I learnt a lot that day like how will you explain conditionals , I am telling you it is not as easy as it looks. Thanks to Gautham Sir, Shreelaksmi ma’m and Abraar for getting me this opportunity to do something this amazing , hope we will do more of such programs.